Summertime is finally here, and it’s my favorite time of year. I love cooking for parties and potlucks, but in the summertime it’s definitely no fun to be stuck in a hot kitchen! Therefore, I’ve decided to make a Peach Raspberry Melba No-Bake Cheesecake. It’s super delicious, easy to make, and requires no hot oven whatsoever, especially with the help of all my amazing KitchenAid® appliances. You’re going to love this chilled creamy cheesecake with vanilla poached peaches and a homemade raspberry sauce. It’s quite refreshing and is simply the perfect dessert for the summertime months! First you need to start out by making the graham cracker crust. Place your graham crackers in the bowl of your KitchenAid® Food Processor and mix on the high setting until the crackers form fine crumbs. Pour the graham cracker crumbs into the medium-sized bowl from your KitchenAid® Mixing Bowl Set. Then, stir in the sugar. Meanwhile, melt your butter in the 3.0-Qt Saucepan from your KitchenAid® Stainless Steel 8-Piece Set over medium-low heat. Once melted, pour the butter into crumbs/sugar mixture and mix well with a spatula. Press the crumb mixture into your KitchenAid® Springform Pan, spreading it 1 1/2″ up the sides of the pan. Next you’re going to make the delicious creamy cheesecake filling. Beat the cream cheese in your KitchenAid® Stand Mixer over medium-high speed (4 or 6) until smooth. Beat in the condensed milk, a little at a time, scraping the sides of the bowl as necessary. Then, beat in the lemon juice and vanilla. Pour the filling into the crust and smooth the top with a rubber spatula. Cover the Springform Pan with plastic wrap and refrigerate until firm, approximately 3-5 hours. While the cheesecake is setting up in the refrigerator, let’s get working on the vanilla poached peaches. 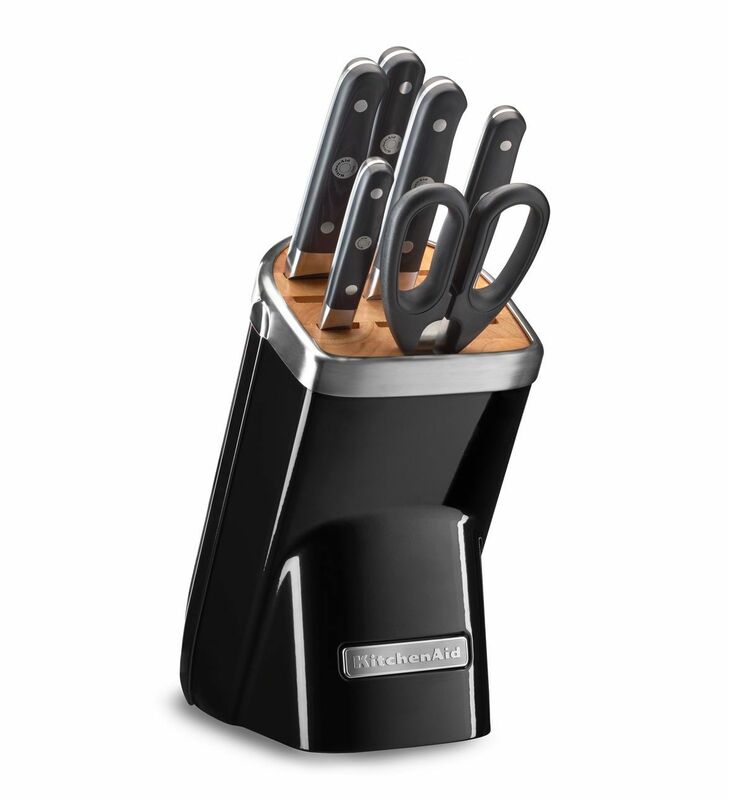 Cut a shallow X in bottom of each peach with a sharp Paring Knife from your KitchenAid® 7 pc Cutlery Set. Fill your KitchenAid® Electric Kettle with water and bring to a boil. Place the fruit in the largest bowl from your KitchenAid® Mixing Bowl Set. Then, pour the hot water over the peaches and let sit for up to 5 minutes. Transfer the peaches to your Cutting Board and peel, starting with the cut end. Then, cut each peach in half or in quarters with your Paring Knife and discard pits. 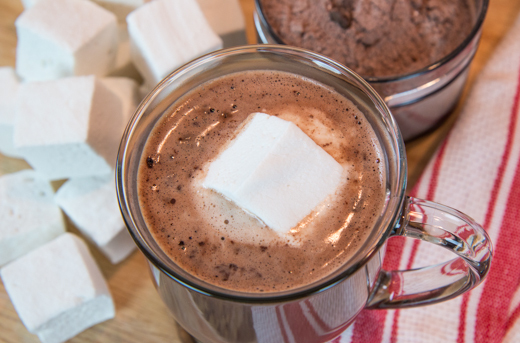 Combine sugar and water in the 3.0-Qt Saucepan from your KitchenAid® Stainless Steel 8-Piece Set. Halve the vanilla bean lengthwise with your Paring Knife and scrape the seeds into your Saucepan. Then, add the pod and bring mixture to a boil, stirring until the sugar is dissolved. Add your peaches pitted sides down to the sugar syrup. Reduce the heat, cover the Saucepan with your lid, and poach the peaches by simmering for 6 minutes. Turn peaches over and continue to poach, covered, until tender, about 5-6 minutes more. Cool the peaches in the poaching liquid uncovered for 1-1 1/2 hours. While the vanilla poached peaches are cooling, it’s time to make the raspberry sauce. In the 3.0-Qt Saucepan, stir together the raspberries, powdered sugar, and lemon juice over moderate heat. Heat until the raspberries begin to release juice, stirring often during this process. Then, raise the heat to medium high and continue to cook, stirring occasionally, until slightly thickened, about 1 minute. Strain the fruit mixture through a fine-mesh sieve, pressing on solids to extract all liquid. Now that you have your raspberry sauce and vanilla poached peaches, it’s time to assemble your cheesecake. Unclasp the sides of your Springform Pan to remove the cheesecake. 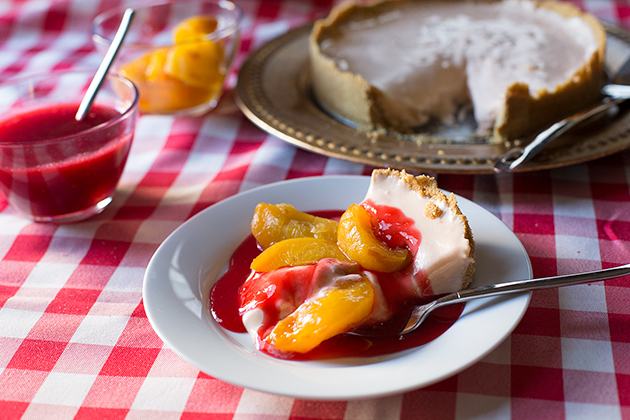 Serve each slice with the vanilla poached peaches and raspberry sauce on top. And there you have it, an easy dessert recipe that requires no hot oven. 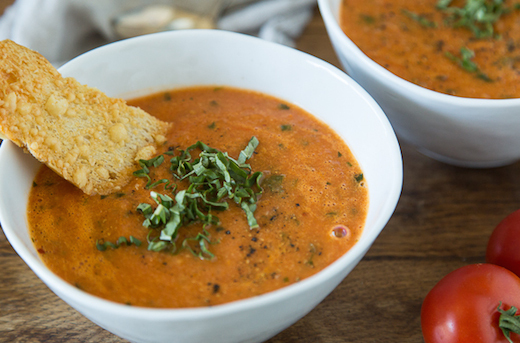 I’m so excited for you to try this recipe for yourself. Get as creative as you want with the no bake cheesecake base, and just have fun with it! 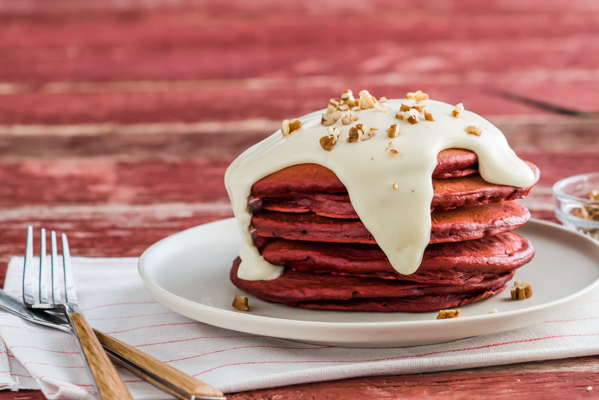 Be sure to share your take on this Peach Raspberry Melba No-Bake Cheesecake recipe with us on Instagram using #MadeWithKitchenAid for a chance to be featured. Place the graham crackers in the bowl of your KitchenAid® Food Processor and mix on high setting until very fine crumbs form. Pour the crumbs into the medium-sized bowl from your KitchenAid® Mixing Bowl Set and stir in the sugar. 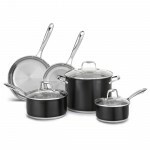 Melt the butter in the 3.0-Qt Saucepan from your KitchenAid® Stainless Steel 8-Piece Set over medium-low heat. Then, pour the melted butter into the crumbs/sugar mixture, mixing well with a spatula. Press the crumb mixture into your KitchenAid® Springform Pan, spreading it 1 1/2″ inches up the side and pressing it down flat. Next, make the cheesecake filling. 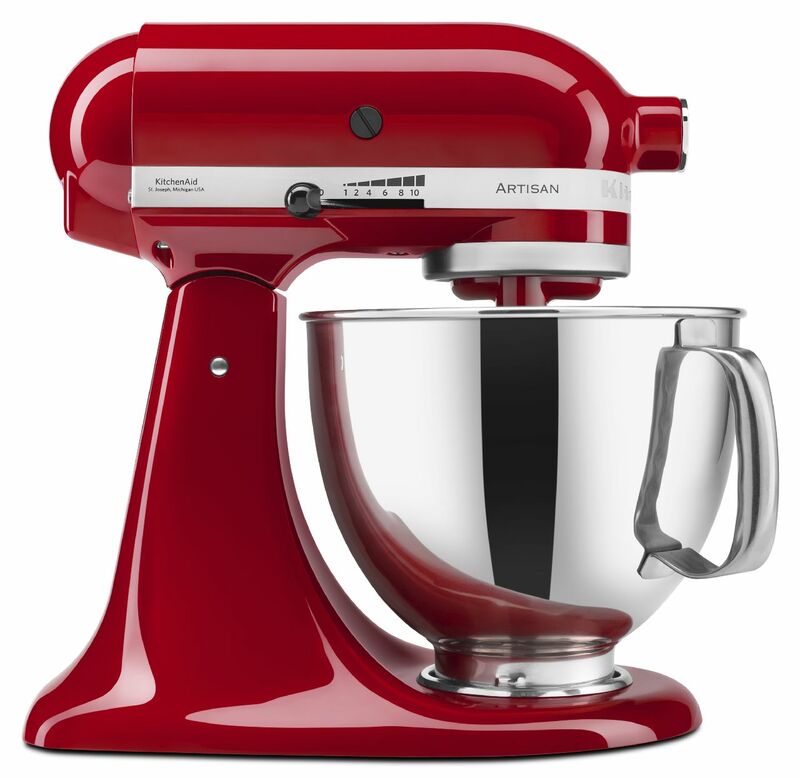 Beat the cream cheese in your KitchenAid® Stand Mixer over medium-high speed (4 or 6) until smooth. Beat in the condensed milk, a little at a time, scraping the sides of the bowl as necessary. Then, beat in the lemon juice and vanilla. Pour the filling into the crust and smooth the top with a rubber spatula. Cover with plastic wrap and refrigerate until firm, approximately 3-5 hours. Unclasp sides of Springform Pan to remove cheesecake. Serve with poached peaches and raspberry sauce (recipes for each below). Cut a shallow X in bottom of each peach with a sharp Paring Knife from your KitchenAid® 7 pc Cutlery Set on your Cutting Board. 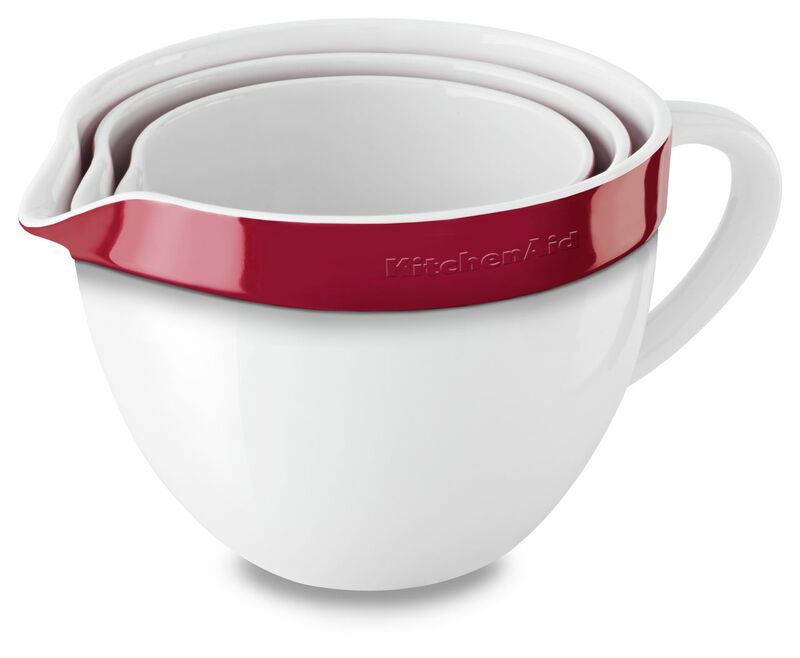 Place the fruit in the largest bowl from your KitchenAid® Mixing Bowl Set. 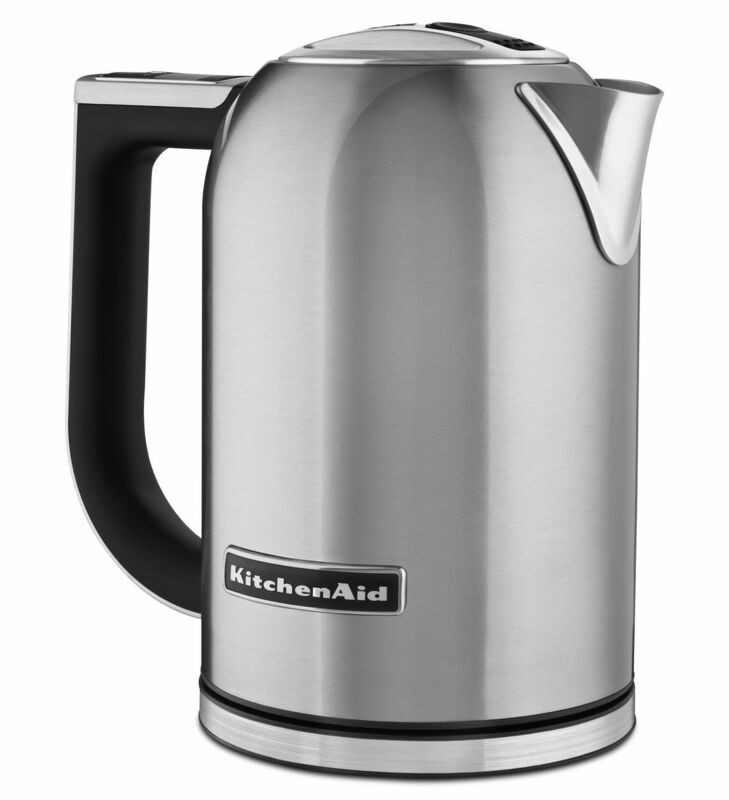 Fill your KitchenAid® Electric Kettle with water and bring to a boil. Then, pour the hot water over the peaches and let sit for up to 5 minutes. Transfer the peaches to your Cutting Board and peel, starting with the cut end. Then, cut each peach in half or in quarters and discard pits. 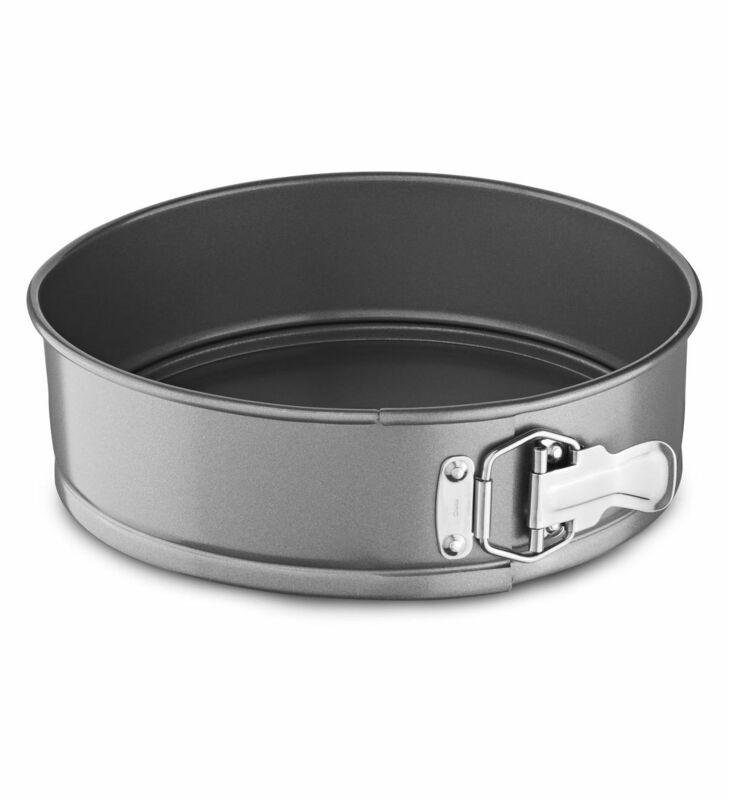 Combine sugar and water in the 3.0-Qt Saucepan. Halve the vanilla bean lengthwise with your Paring Knife and scrape the seeds into your Saucepan. Then, add the pod and bring mixture to a boil, stirring until the sugar is dissolved. Add your peaches pitted sides down to the sugar syrup. Reduce the heat, cover the Saucepan with your lid, and poach the peaches by simmering for 6 minutes. Turn peaches over and continue to poach, covered, until tender, about 5-6 minutes more. Cool the peaches in the poaching liquid uncovered for 1-1 1/2 hours. Serve over the cheesecake. In the 3.0-Qt Saucepan from your KitchenAid® Stainless Steel 8-Piece Set, stir together the raspberries, powdered sugar, and lemon juice over moderate heat. Heat, stirring often, until the raspberries begin to release juice. Raise the heat to medium high and continue to cook, stirring occasionally, until slightly thickened, about 1 minute. Strain the mixture through a fine-mesh sieve, pressing on the solids to extract all the liquid. Serve with the poached peaches over cheesecake. Or, store the sauce in a sealed container in the refrigerator for up to 1 week.